Kofi Annan, then Secretary General of the United Nations, and Plantu, editorial cartoonist at the newspaper Le Monde, gathered, on October 16, 2006 at the United Nations headquarters in New York, twelve of the world’s greatest press cartoonists around a conference entitled “Unlearning Intolerance”. This symposium gave birth to Cartooning for Peace project. To strengthen this unique movement of a kind and finance activities at local and international levels, the Cartooning for Peace Swiss Foundation was established in 2009 with support from the Swiss Ministry of Foreign Affairs (FDFA) and the United Nations Office in Geneva. Co-founded by press cartoonists Chappatte and Plantu, and Marie Heuzé, a former spokesman of the United Nations in Geneva, the Cartooning for Peace Foundation has its headquarters at the Geneva Press Club. Swiss Foundation registered on June 17, 2009, the Cartooning for Peace Foundation was created with the help of the Swiss Ministry of Foreign Affairs and the support of the United Nations in Geneva. The Cartooning for Peace Foundation and the City of Geneva created an International Press Cartoonist prize awarded in Geneva every two years on the occasion of the International Day of Freedom of the Press, on May 3. This award recognizes press cartoonist’s outstanding contribution to human rights, freedom of expression and their work in favor of tolerance and peace. Their approach and commitment is therefore recognized all around the world, especially if their cartoons were published in a political context of repression and censorship. The prize cannot be awarded posthumously. The International Press Cartoonist Award is granted on the recommendation of an independent jury composed of members from different backgrounds: Nobel Peace Prize, Mayor of Geneva, Founders of Cartooning for Peace, Defenders of Human rights and personalities known for their commitment to Freedom of expression. The nominees will be proposed to the jury by the 124 cartoonists members of the Cartooning for Peace network. 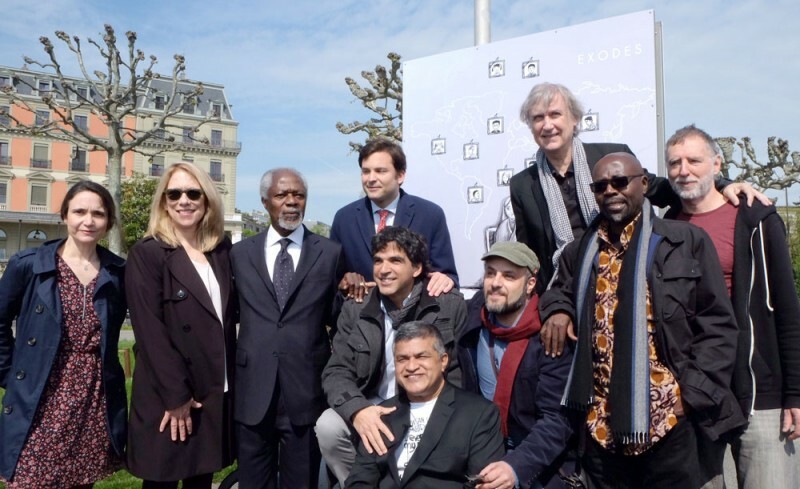 The award was presented for the first time on May 3, 2012 in Geneva by the Mayor of the City and the honorary president of the Foundation, Mr. Kofi Annan. In parallel of the International Press Cartoonist Award, every two years, the Foundation displays a press cartoon exhibition in very large formats on the banks of Lake Geneva. This exhibition, aside from being a tribute to the cartoonists awarded by the International Press Cartoonist Award, is also a collection of international press cartoons on topics related to fundamental freedoms and Human rights. Cartooning for Peace is also present in Switzerland, thanks to its Swiss Foundation. Take a look at CFP foundation's information. Cartooning for Peace raises awareness about important issues through humour and press cartoons. Have a look at our educational projects and exhibition kits! Freedom of expression, war and peace, human rights, environmental issues... Have a look at our collections of international press cartoons!